It is a while since I have been totally blown away by a book. Here is that book – a very generous gift to me from Mai, one of my Estonian readers. 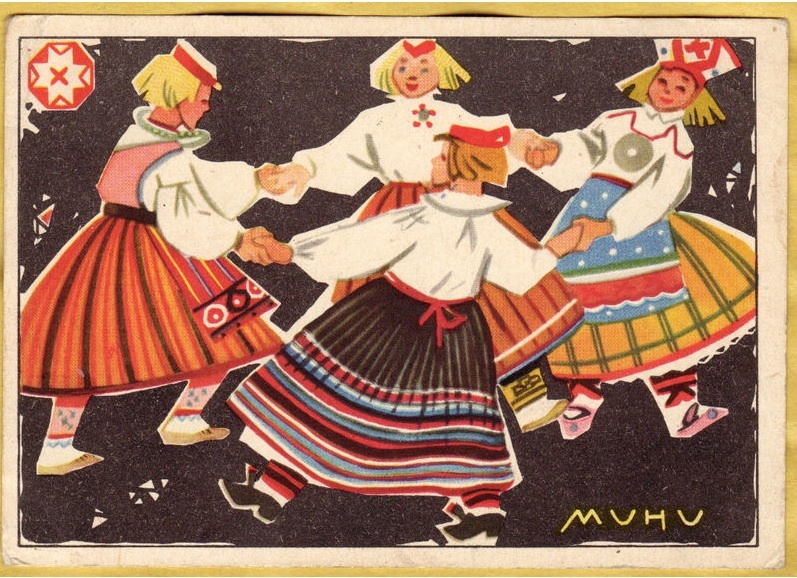 Like other areas of Estonia, Muhu island is proud of its textile traditions. 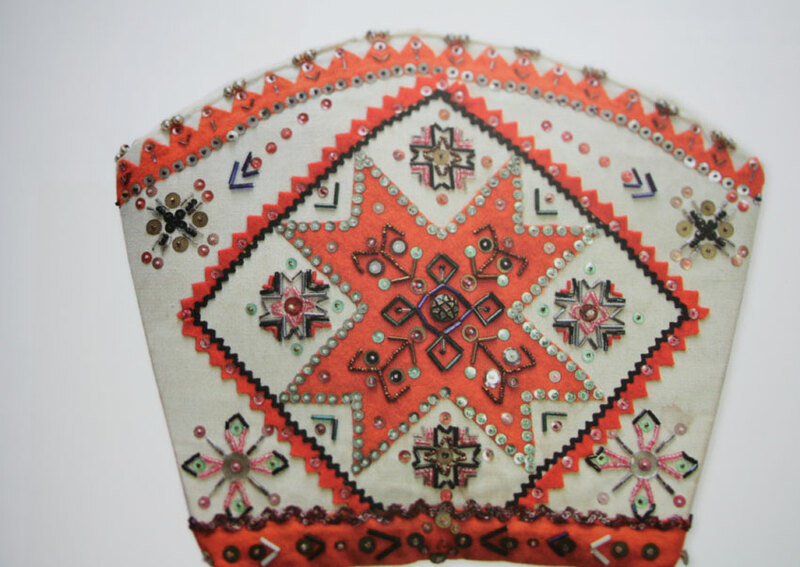 These textile traditions are many, varied, and very distinctive, and this distinction and variety is due to the incredible needlework skills of the women of Muhu. 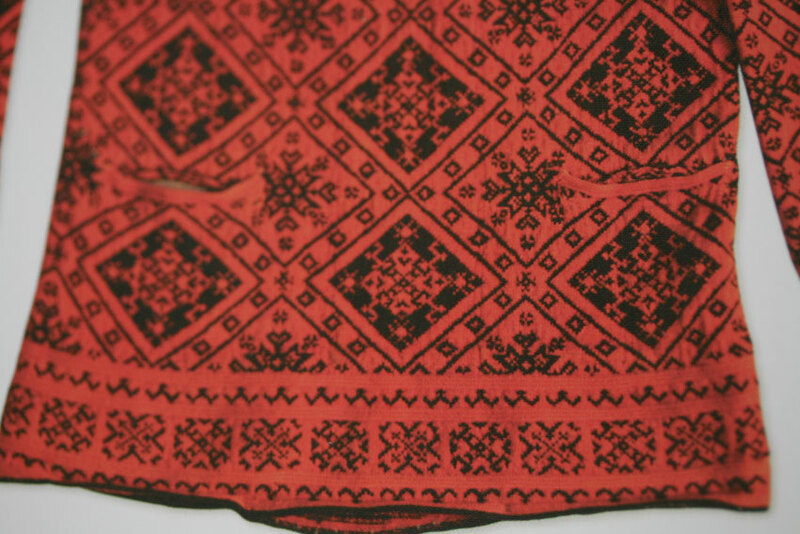 I’ve written a little before about how interesting I find Estonian ‘folk’ costumes, and about how the strong sense of regional and national identity one sees expressed in such textiles emerged against a backdrop of cultural annexation. 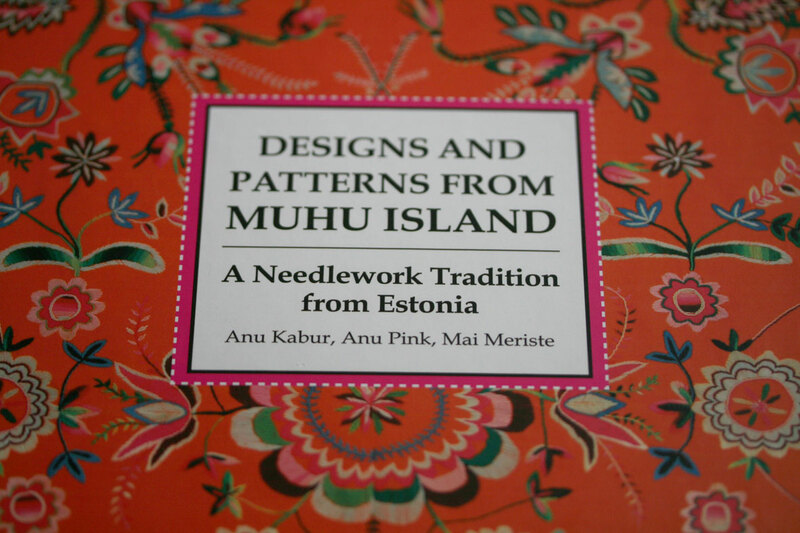 I have only had the opportunity to read about Estonian knitted textiles before – but this book gives a much fuller picture of the wide-ranging skills of the women of Muhu, who are clearly possessed of a quite remarkable creative energy! Muhu knitters. 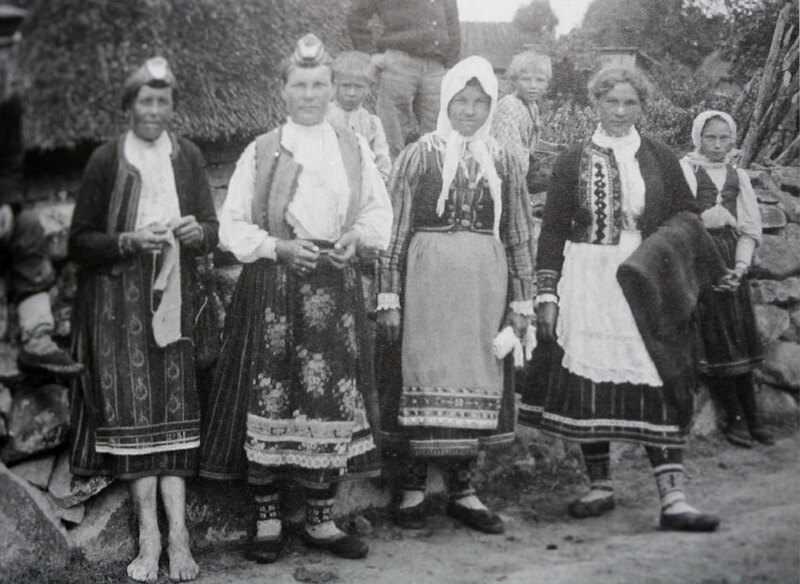 Photo reproduced from Rina Tomberg, Vatid, Troid, Vamsad: Knitted Jackets of West Estonian Islands. (Estonian Academy of Arts, 2007). But what makes Muhu very different from Shetland – and what I had never thought about until I absorbed myself in this marvelous book – is that domestic textiles (until very recently) never expanded beyond being dowry gifts or heirlooms into being produced for a market. Kabur, Pink and Meriste explain that the driving principle behind Muhu women’s production of domestic textiles was “to make one’s clothing as fine as the finest garment of one’s home village, and even a little bit better.” Without the pressures of external commercial markets, the women of Muhu simply competed among themselves to produce domestic textiles of ever-more glorious variety, ornament and colour. I think it is the sheer variety of styles and skills that I find most striking about these textiles, which include . . .
Stranded colourwork mittens, gloves and stockings – here with duplicate stitches . . .
stockings and gloves with travelling stitches . . . 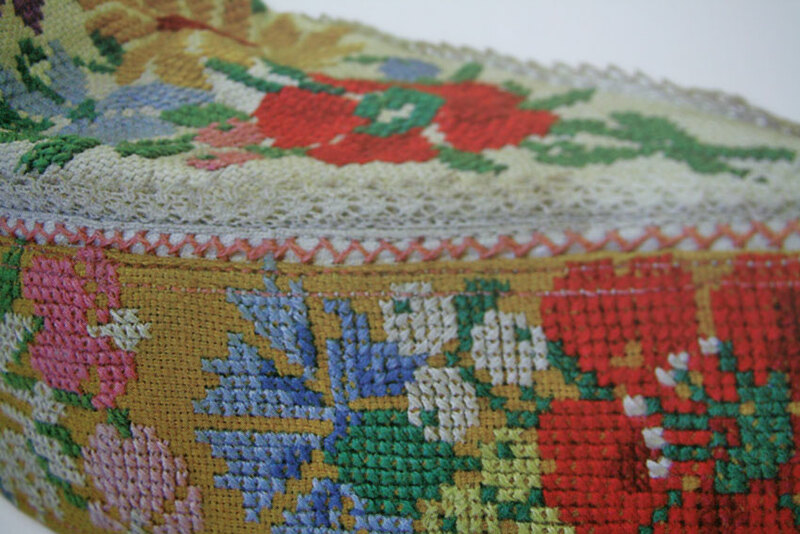 There are also examples of different kinds of weaving, machine embroidery, and lace techniques. Clearly these women have an inexhaustible range of textile talents! Kabur, Pink and Meriste introduce the reader to gloriously decorative slippers and blankets, aprons and belts, skirts and jackets, stockings, gloves and baby garments. And as if the sheer range and variety of highly-skilled techniques that these women had mastered wasn’t enough, they then start to combine them in ways that are quite breathtaking. 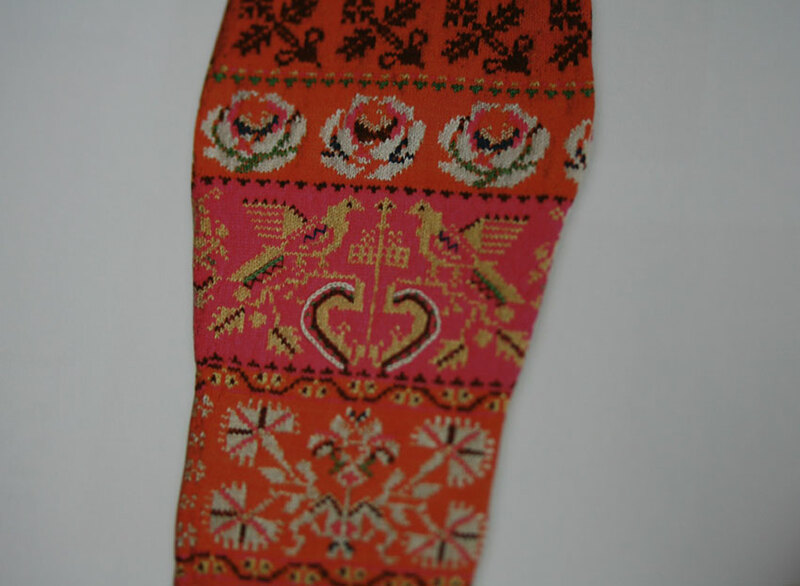 Handknitted stocking with openwork and cross stitch (knitted and embroidered by Eleena Tuulmägi of Lõetsa village in the 1970s. Now owned by Tiina Tuulmägi). But it isn’t just the pictures in this book that are absolutely wonderful. Kabur, Pink and Meriste also provide charted instructions for much of the embroidery, crochet, and knitting, and talk about technique in a way that not only demonstrates their own practical knowledge, but generously allows the reader to share in it as well. 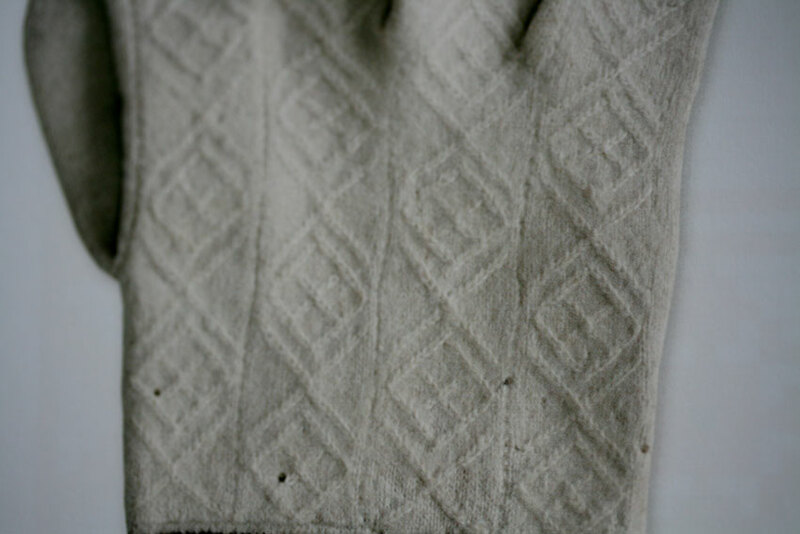 So the editors introduce the reader to, for example, the distinctive Muhu zigzagging decrease (which I am itching to try out on a sock) and explain how large bold motifs were added to the centre of plain-coloured mittens (using a particularly nifty combination of intarsia and double knitting). This combination of the historical and the practical is what makes their book so very good, and it is really quite unusual. Textile books are often rather rigidly (and annoyingly) divided between the academic or the ‘how to’ markets, but Kabur, Pink and Meriste’s super tome happily crosses that divide, allowing the reader to gain a close, material understanding of some truly amazing objects – the sort of understanding that you would only ordinarily gain by taking a visit to an archive, handling textiles, turning them inside out, examining their stitches and their seams, decoding their canny methods of construction, and then going away to try things out for yourself. It is an absolutely brilliant book: the images are glorious, the cultural information is carefully and respectfully put together, the instructions for the different techniques are clear and well-demonstrated. Having this book in one’s hands really is the closest thing I’ve ever encountered to actually being right in among a museum textile collection. It is a very rare treat. Now, when do I get to go to Estonia? So thankyou, Mai, for this lovely gift; thankyou, Anu Kabur, Anu Pink, and Mai Meriste for making this treasure trove available (and in English, too, which is a particular treat for me) and thankyou, most of all, to the needlewomen of Muhu to whose incredible talents this book pays fitting tribute. I’m thrilled to have been introduced to – and enormously inspired by – you all. Lovely! I came across this blog while looking for Estonian knitting and weaving patterns for a couple projects I want to start. I am of Estonian descent: grandparents escaped from Saaremaa, another West Estonian island, during WWII. 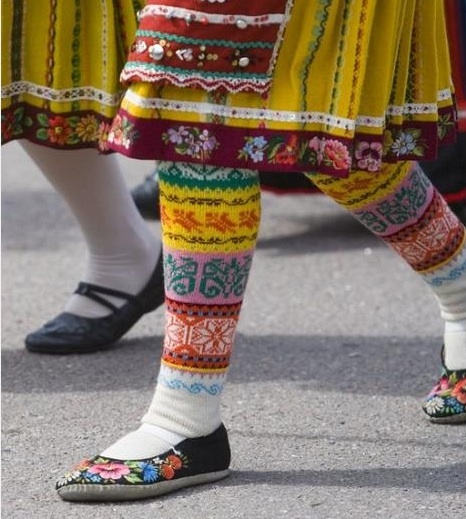 They brought their traditions with them to Canada, which I grew up with, including folk dancing, wearing folk clothes for special events, speaking Estonian and eating Estonian food! As a kid I didn’t appreciate it much and just wanted to be “Canadian”, but as an adult I have been doing more research into my heritage and love coming across blogs that mention how awesome Estonian traditions are! 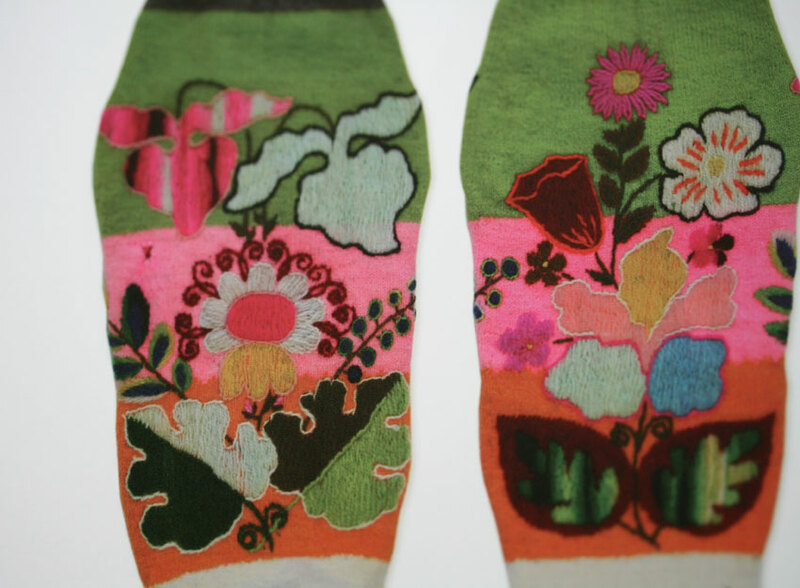 Thanks for spreading the word about Estonian textile traditions! Gudrun Sjoden (Swedish designer) has used this book as inspiration for her Autumn collection, which is fabulous! 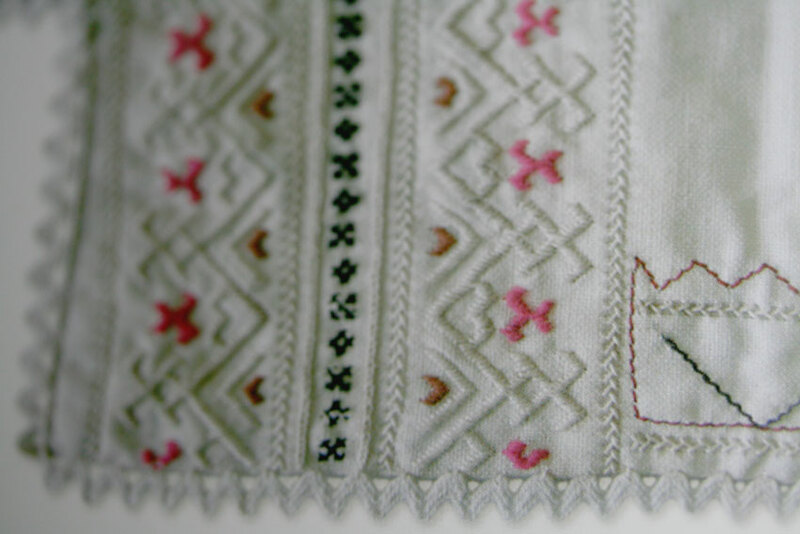 I stumbled across your blog while researching Muhu textiles. My father’s family made a daring escape from Muhu during WWII, and my grandmother brought with her to Canada the entire repertoire of textile art represented in this book. I grew up on the prairies of Alberta dressed in Muhu embroidered slippers and beautifully patterned hats, mittens, and sweaters. Our sofa was adorned by cross-stitch cushions and wave afghans. When my grandmother passed away, she left me her hand-woven, hand-dyed, hand-embroidered, hand-sewn yellow Muhu skirt. I regret deeply the extent to which our entire clan took for granted the incredible artistry of her work. Grandma knit and embroidered all of the designs pictured in _Designs and Patterns from Muhu Island_ without ever looking at a pattern on paper. She had it all in her head. She’d turn out the most complicated fair-aisle at a speed comparable to a knitting machine, and this with one eye on the television watching CBC! 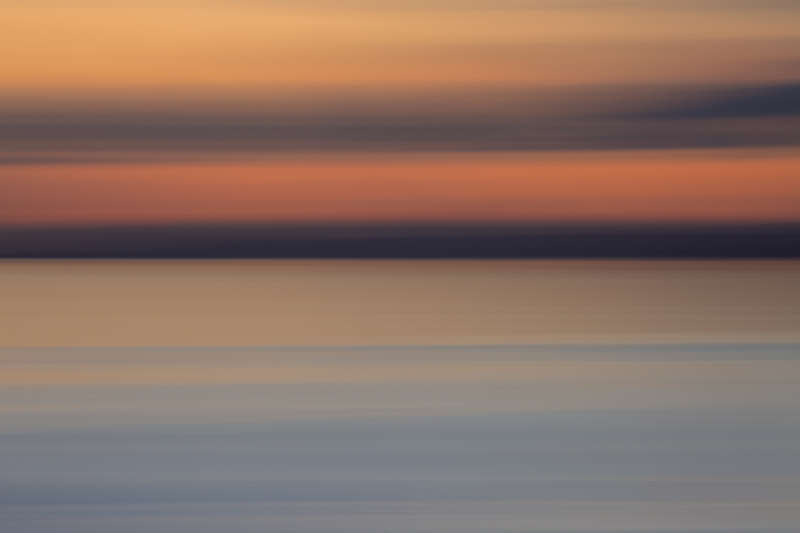 Thank you for posting about _Designs and Patterns from Muhu Island_. I ordered it immediately and it arrived yesterday. Poring over its pages is like visiting with Grandma once again. Thank you for this book review Kate! I have got my copy from Estonia now and I´m so happy! The book is a true treasure. Thanks for showing off this book! Although a set of my great-grandparents were Estonian immigrants to the US, all my Estonia connections died long before I was born. Although Estonia is on my travel wish list, I have to enjoy what cultural information I can find as my ancestors didn’t leave much information about their origins behind. Having neither a long family history in America nor in a far away homeland, it underscores that the common story is not of far off relationships to kings but to generations of hard working people who still were able to create beautiful things and rich traditions despite few luxuries in life. Also, maybe I should go embroider that knitted cap instead of procrastinating it further. Oh the pieces are divine! What beautiful designs and work, and the way they place the colourful motifs together, the visual impact is so pleasing, it never grows old. I have always loved these types of Estonian designs. You must love them Kate. What a fantastic book! Or more, what a fantastic knitting tradition. I love the idea of women competing to see who could make the most beautiful knitting piece. It takes the concept of art versus craft to an entirely different level. I took a class in my undergraduate days entitled Women and Fiber Art Traditions. Although it was ultimately quite disappointing, one of my favorite discussions was the hierarchy of craft versus art and how women’s arts were traditionally their crafts. But now I’m rambling, a bit incoherently. Also, had a bit of a thrill at seeing Lynn Abrams’ name. I was in contact with her this summer when I was deciding to which university I should pitch my Fulbright application. I didn’t pick U Glasgow, but it was a very close call. Had I gone for U Glasgow I would have followed Dr. Abrams like a crazy, knitting history obsessed puppy. Stunning book. I am sure you will get endless inspiration from it. It’s gone to a good home. Looks like a must-buy. Pattern books come and go, but this type of documentation needs to be supported. I also thought the bright colors reminded me of Berlin wool work. A connection? Gosh that was better than discovering precious gems! Thank you for letting us know about the book Kate. I bought the book as a Christmas present to myself, it’s utterly wonderful and packed full of inspiration and the natural sense of design and colour amazes me. I bought mine from http://www.kriso.ee/Designs-Patterns-from-Muhu-Island-Needlework/db/9789949918133i.html – which works out as rather cheaper than other sources. I think that the connections between the Baltic, Scandinavia and Scotland are connected with the historic settlement by the vikings and later on the trade of the Hanseatic League. Now that would be something to reseach! thanks, Charlotte – this looks like a good online source for the book. Thank you so much for sharing: your insight, your life, and your love and connection to textiles everywhere. Absolutely stunning book! Thank you for letting us know about it. I’m hoping to get a copy for our school library as a wonderful resource for textiles and design. LHolg – sewer, knitter and teacher librarian, Sydney, Australia. Thank you so much for sharing these wonderful treasures with us. I would truly like to read Muhu as well as the Shetland book and will try to find them here in the States. Those textiles are beautiful and amazing! The creativity is so inspiring. Wow…this is so interesting, thank you for sharing this. I’m so grateful you shared this with us all. So interesting and inspiring. Stunning- fantastically joyous and rhythmic. My thanks, as always, for educating us knitters! What a gorgeous book – I can’t wait for your next design, and I’d love to be reading a needled post from Estonia one day…. I discovered your blog about a year ago. It is always so inspiring to reed, but todays post brings tears to my eyes. My grandmother lived in Western-Estonia in a beautiful place called Kullamaa (Golden Land). So, not in the Muhu island, but in the area, where the textile tradition are quite similar. It is just so good to read, that you like our folkcostumes, because thanks to my grandmother I have loved them since childhood. Thank you, Kate for your blog! That is an extremely inspiring peek into a very interesting book. I wonder how some of those colourwork knitting designs were worked out – would they have put the design down on paper first, either as a sketch or a formal chart? It’s hard to imagine some of those designs being kept in someone’s head while they worked. It would be wonderful to be able to make anything a fraction as beautiful as these items. Thanks a lot for sharing all this !!! WOW. my favorite color is orangeandpurple, but i must say orangeandpink is very fine. 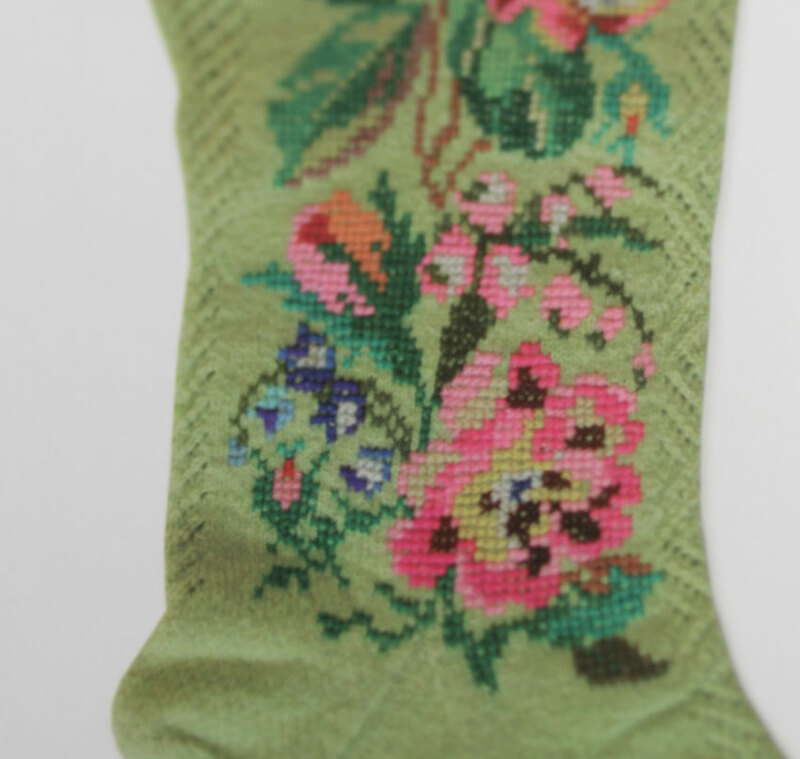 floral cross stitch on sox, i am blown out of the water. the pic of the floral embroidered wine-colored band on the hem of the skirt contrasting with the more geometric pattern of the sox is almost making me faint. i’m going to have to save up and get me this one. fabulous, fabulous, fabulous. I am leaping up to buy this one – not only for the pictures (although they would merit it on their own), but because you say it combines the academic with the how-to. I look forward to boundless inspiration. p.s. off-topic, but: did you get my recent email with (late) Wovember news? And my reply to your questionnaire on uniform-wearing, some months ago? Fascinating – and I was intrigued to also notice the striped skirts so characteristic of eastern / northern european traditional dress (also historically in Shetland, of course). I love the fact that the areas where you still find these stripy skirts – or found them until recently – often overlap with the areas where there’s also evidence for string skirts going back at least to the Bronze Age, and possibly, much, much further… Could the stripes be a solid-fabric representation of a very old tradition? Some Serbian costumes still have actual string overskirts, too. 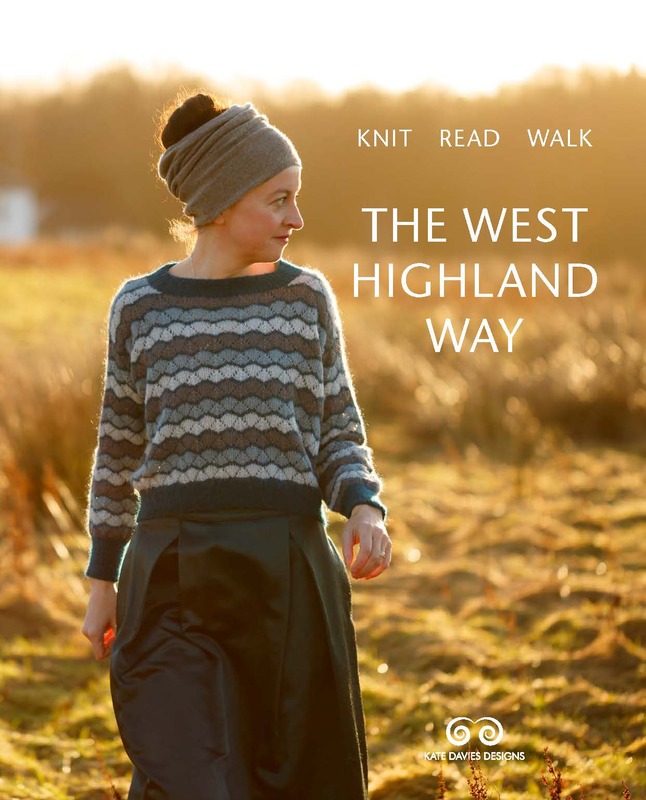 And there’s so much more than stripy skirts here, of course… must track book down…. thank you! 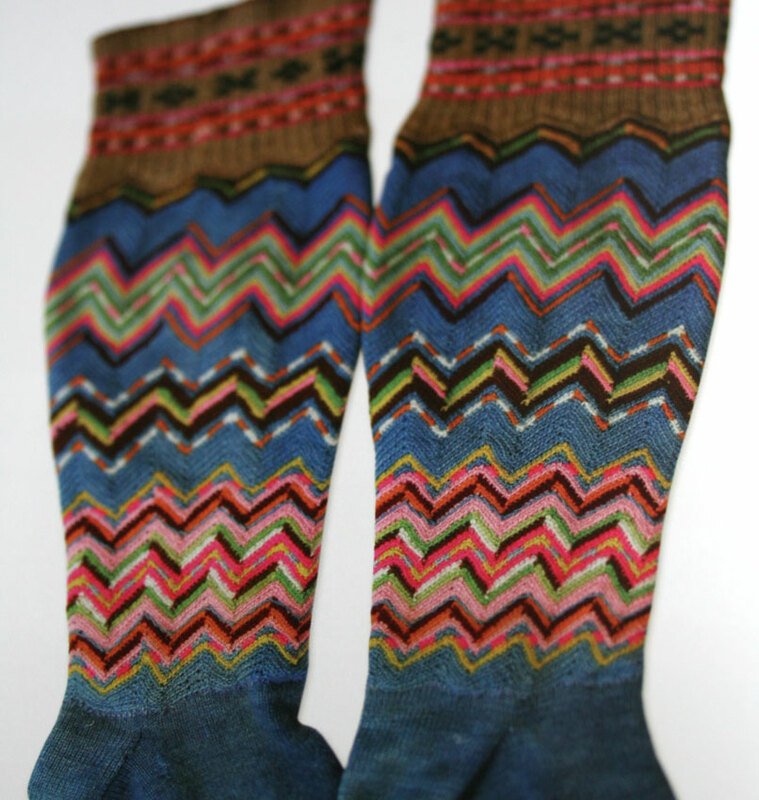 I think I need to make those legwarmers from the top picture….. Thanks for sharing. These textiles and the representation of knitting is gorgeous. I am in love. Thanks for sharing your love of textiles. What an amazing book! Truly beautiful. Thanks for sharing. While some people said it doesn’t seem readily available online, I easily found 2 places that carry it: Loop (http://www.loopknittingshop.com/product/4563/Designs_and_Patterns_from_Muhu_IslandEstonian_Needlework_ ) and in the US Wooly West (http://www.woolywest.com/Pages-Products/p_booksother.html ). Wow. Such incredibly fine beautiful work…. The gauge on those gloves looks infinitesimal. And that men’s “vatt” – swoon! Thank you for this very informative review. I love books and appreciate your detailed information very much. This book looks really amazing. I hope I can track it down some day; it doesn’t seem to be readily available. But even just seeing the pictures you’ve provided are very inspiring. Thank you for sharing these beautiful photos and comments on the Shetland and Muhu knitters. So interesting. The comparison of Shetland and Muhu is especially interesting since they are islands and contained. Anthropologists suggest that ways of doing things can easily spread by “cultural diffusion,” which means someone moves from one culture to another and takes things with them. People in the new culture then add their own twist and pass it on again and again. It’s possible to follow the migrations of people by following their stuff. But cultures can also spontaneous invent similar things in isolation. Knitting is both invented all over the globe and also often influenced by other cultures. Shetlanders say their motifs came from a wrecked ship of the Spanish Armada that crash on Fair Isle, but in truth, nobody knows where their style came from, and maybe a group of women invented it all by themselves. I am SWOONING. Thank you for this wonderful review. Now to see if my LYS will order the book for me! Kate, thank you for this wonderful post and for sharing this book with us. I would be very interested to hear more about the yarns and threads used for these wonderful pieces and most particularly the source of their colour. I assume the more recent items are worked in commercially available yarn, but does the book tell us more of Mohu’s spinning and dyeing traditions? OMG! Breathtaking—I would love to get my hands on that book. Thank you so much for sharing it with us. I am blown away!! How absolutely stunningly beautiful!! And counted cross stitch too. OH MY CARP. AM totally overwhelmed. 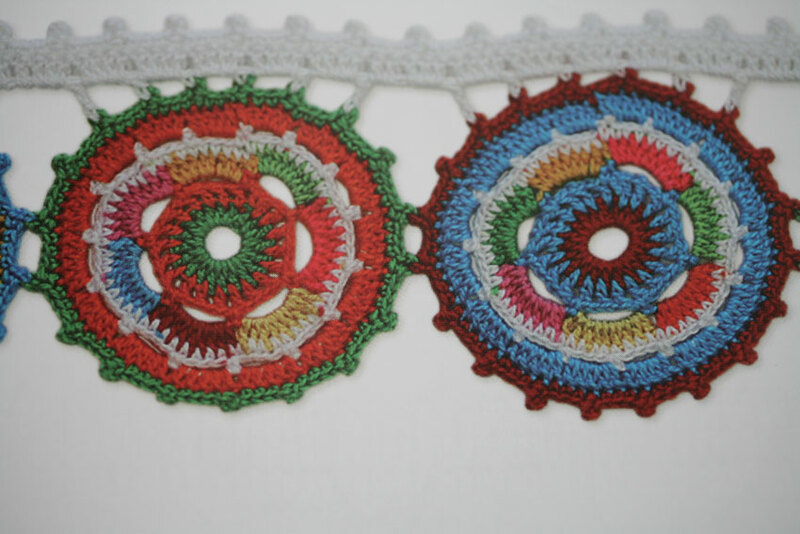 Thank you for sharing the beautiful hand work from Estonia. Now, that is some impressive eye candy! I love the charming illustration the the girls in a circle. I’m salivating just looking at these stockings. What beautiful heirlooms these women have produced! Cheers, Hazel. i live on the island of newfoundland. 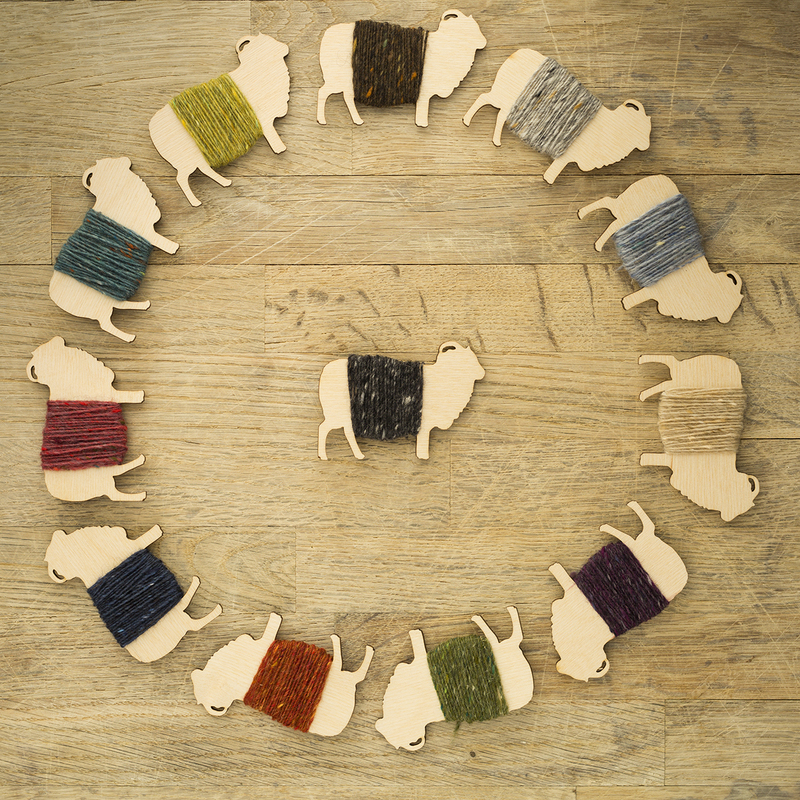 aside from music, it is textiles that set us apart from the rest of canada – rug hooking and knitting.this summer i’m taking a trip to shetland – partly because of what you have shown me. maybe muhu will be next! Fascinating post. I must say, I think the way that you repeatedly cross the divide between the academic and the ‘how to’ is one of the things that makes this blog so outstanding. Wow!! What an incredible book and what an incredible story. Thank you for sharing this Kate.